Michael has lived in Fanwood for over seventeen years with his wife Carol. They have 2 children, Bess and Ella. He has worked at the JCC of Central New Jersey for fourteen years, and on November 1, 2018 he became their new Executive Director. 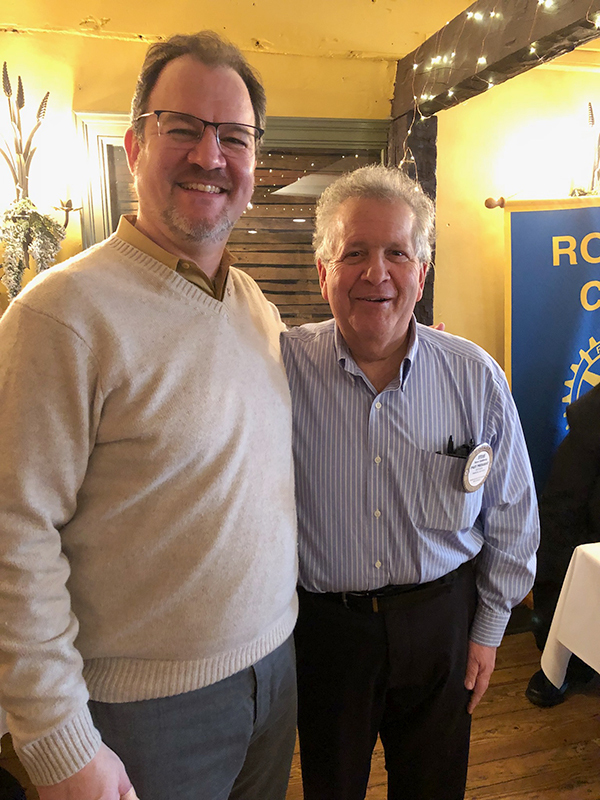 Members of the Fanwood Scotch Plains Rotary Club are from diverse walks of life – from business and professional roles in government and non-profit organizations. Rotary is non-religious and non-political, open to members of any race, culture or creed. Members are committed to making their communities better places to live, as they enjoy the fellowship of Rotary with like-minded persons. They carry out a broad range of cultural, humanitarian, and education programs that touch people’s lives in the local and the global community. Meetings are held every Wednesday at 12:15 p.m. at The Stage House Restaurant, Park Avenue, Scotch Plains, NJ. For more information please visit fsprotary.org or on Facebook: Fanwood-Scotch Plains Rotary Club. (above, l-r)) Michael Goldstein was inducted into Rotary by Steve Goldberg.